Yet another post on the progress of the house up on Sunshine Canyon. Designed by Mark Gerwing, with David Biek, Stacey Root and Brian Nelson at Arcadea, the house is being built by Cottonwood Custom Builders. We are well past the half-way mark and the pace of finishes is picking up with most of the exterior stone already installed. 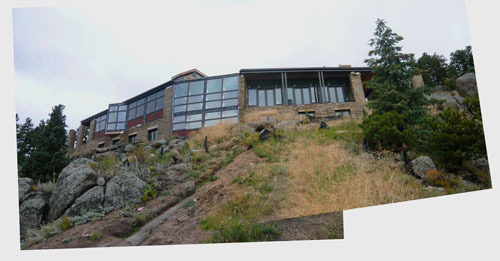 This is a photo from down the steeply sloping site looking back up at the east face of the building.